A grand reception in the likes of the Ottoman Empire has welcomed Palestinian Authority President Mahmoud Abbas to Anakara, as Turkey resurrected images of past warriors to greet the foreign leader. 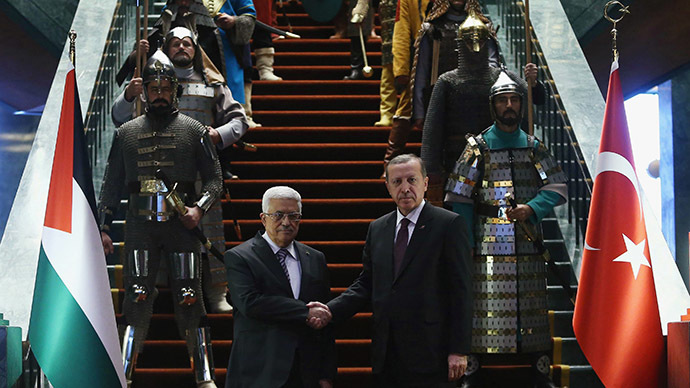 Accompanied by spear-carrying warriors and guards in chainmail and golden helmets, Turkish President Recep Tayyip Erdogan welcomed Abbas to the new presidential palace - the Ak Saray. The scene of the historical costume drama included 16 warriors each representing one of the 16 empires of Turkish history from the Hunnic Empire, founded around 200 BC, to the Ottoman Empire which was dissolved in 1920. Social media, however, was quick to point to Erdogan's imperial ambitions depicted in the mascarade. “It seems that turkish president @RT_Erdogan thinks he's a #sultan,” user @ddurejko said in a tweet. Some even tweeted women wearing historical Turkish dresses to show that females played a role in shaping the nation's history. The staged ceremony was conducted at Ak Saray, the controversial presidential palace on the outskirts of Ankara that was opened at the end of October. Inspired by Seljuk architecture, it has 1,150 rooms and was built at a cost of around €490 million. The palace houses state-of-the-art communications systems and has bunkers able to withstand biological, nuclear and chemical weapons attacks, according to local media. The presidential quarters are also defended from spies with additional anti-bug measures and security against wiretapping. In his speech after welcoming the Palestinian leader, Erdogan addressed Western states, accusing them of hypocrisy over the aftermath of the Charlie Hebdo satirical weekly's attack last week. He said the West is not doing enough to protect mosques from anti-Muslim attacks. "Please, the administrations in those countries where our mosques are attacked need to take measures," he said. "Games are being played with the Islamic world, we need to be aware of this." Erdogan strongly criticized the presence of Israel's Prime Minister Benjamin Netanyahu at the rally commemorating the victims of the attacks in Paris. "How can a man who has killed 25,000 people in Gaza with state terrorism wave his hand in Paris, like people are waiting in excitement for him to do so? How dare he go there?" Erdogan questioned. Over 40 world leaders joined French President Francois Hollande for a unity rally that drew 1.5 million people on Sunday. These included Abbas and Netanyahu. Turkey was represented by its prime minister. Israeli media reported that Paris initially asked Netanyahu to refrain from attending the rally. However, after he refused, France swiftly invited Abbas to participate, according to reports.